It is that time of year again. No, I’m not talking about the announcement of this years’ winner of the Nobel Peace Prize, but rather the announcement of my shortlist of favorites. This is a tradition that won’t go away. I keep, as Foreign Policy put it, soldiering on, silently hoping this will be the year I get it just right. My favourite this year, as many of you will have noticed, is German Chancellor Angela Merkel. She tops a shortlist consisting of five candidates, each of whom I consider to have a fair shot at winning this year’s prize. But why keep up with this practice, which started with my predecessor here at PRIO? Not just are the chances of actually predicting the winner very slim (there are hundreds of nominees, most of them secret), but even the announcement of personal favorites and predictions are enough to cause a stir. The committee itself has complained about the noise and ruckus which follows the predictions of self-proclaimed experts (I guess that group includes me), claiming it is a distraction from their work. Nobel himself described this as the prize “for advocates of peace”, and did not use the term Peace Prize. The world has changed, and how to interpret Nobel’s intentions is anything but trivial. What, for example, constitutes a ‘peace congress’ in the early 21st century? Since the year 2000, the definitions have expanded to anything from working for the environment (the late Wangari Maathai; Al Gore and the Intergovernmental Panel on Climate Change), to economic development (Muhammad Yunus and Grameen Bank), all prizes that were widely criticized for being outside of Nobel’s declared peace prize sphere. The past six years, under Thorbjørn Jagland’s leadership, we have seen a return to more conventional justifications: disarmament, multilateral cooperation, human rights. This year, Kaci Kullman Five is the new Chair of the Nobel Committee, and they also have a new member in PRIO’s Henrik Syse. Will the changes in the committee mean that the Peace Prize is going in a new direction? Who knows? The global debate about the Peace Prize, in which the speculations play a minor – but in my opinion, important – role, is also important for the quality of nominations. With more people familiar with the fundamental purpose of the prize, as well as the concrete process through which a particular candidate can become seriously considered, the committee ought to get more and better nominations. Certainly, there is a lot of lobbying, and there have been times when the committee has been misled by effective campaigners (the 1974 prize to Eisaku Sato is one example). Mussolini, Hitler and Stalin have been nominated, none of which are exactly lauded for their peace advocacy. It is also worth remembering that until 1960, when South African Albert Luthuli received the prize, all laureates were from the Western hemisphere. Given the stature of the Peace Prize, controversy is to be expected, and the committee has proven, time and again, that it stands its ground, even when subject to extensive pressure – as with the prize to Liu Xiaobo in 2010. In informing a global debate about deserving causes and candidates for the Peace Prize, speculations also offer an important critical corrective to the work of the Nobel committee. The committee’s work is shrouded in secrecy: there is no written record of its deliberations, and its documentation is made public only after 50 years (documents on the process that led to the 1965 prize to Unicef. have just been made public, subject also to an exhibit at the Nobel Peace Centre in Oslo). Critical public exchange is just as important to the Nobel committee as to any other institution entrusted with the power to make important decisions. 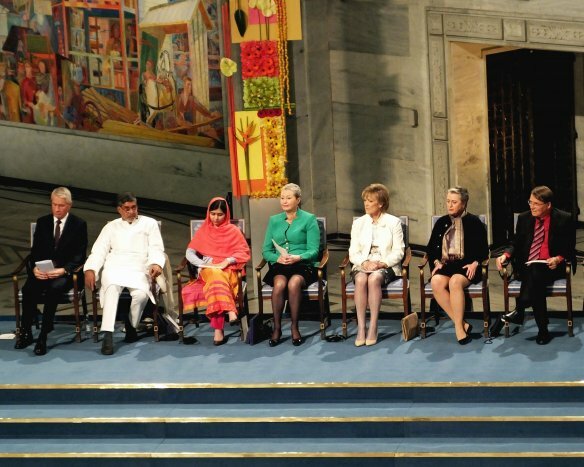 The Nobel Peace Prize has a remarkable history and is widely seen as the most prestigious prize on earth. That success has not come about in a vacuum, but through an engaged public debate over potential candidates and the issues they represent. Even if I get it wrong when the Nobel committee announces the winner of the 2015 Peace Prize laureate this October, I shall continue to offer my speculations. The Nobel Peace Prize is an important prize, which, to maintain its international stature, depends on critical friends. Given the secrecy, we will never know for sure what the impact of speculations is on the committee’s deliberations. I am in no doubt that, even if, more often than not, failing to identify the successful candidate, the speculations inform the global public debate on the Nobel Peace Prize and what it represents.